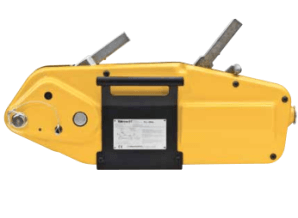 The Yaletrac ST wire rope puller is an enhancement of the standard Yaletrac cable puller and has been developed for use in the mining industry. 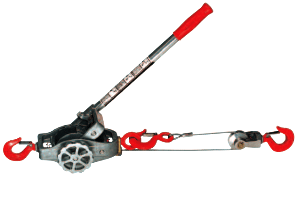 The Yaletrac ST wire rope puller is a special version of the standard Yaletrac cable pullers. It has been designed especially designed in steel for using in the mining sector; there is no aluminium in this model. The deep drawn, steel plate main body ensures it is optimised for the best weight, best stability and compact design whilst maintaining its robustness. Another of the main differences between this ST model and the standard Yaletrac is that the operating levers now have axial ball bearings which greatly optimise the hand operating forces required. Along with the telescopic handle, which can be stored on board these devices are very easy to use. 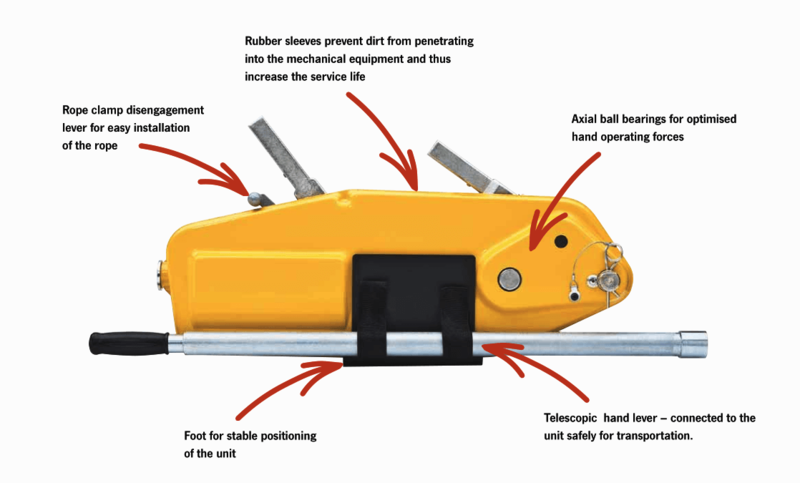 The ST cable puller possesses a foot to allow stable positioning of the device. The Yaletrac ST incorporates rubber sleeves to offer protection against dirt and dust particles which can affect performance. These rubber sleeves will also help lengthen the service life of the cable puller. 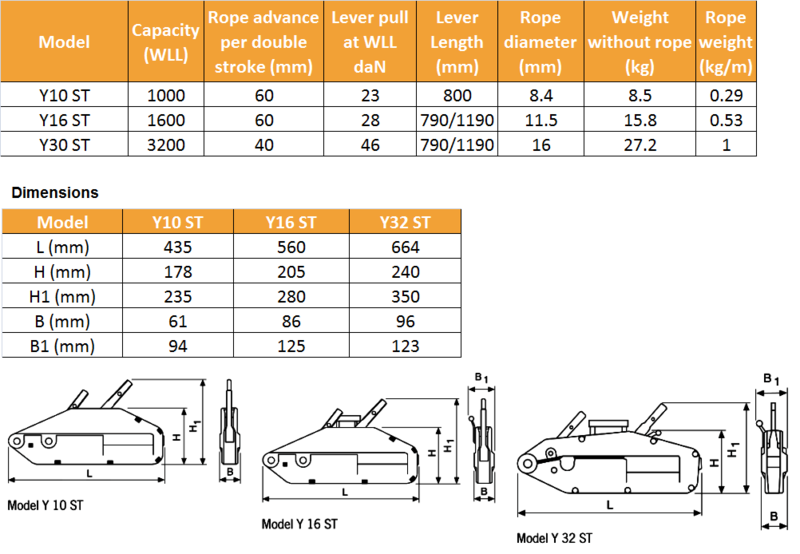 The tandem positioned levers and clamping system provide optimum, in line transfer of power, evenly distributing the forces to enable more protection to the wire rope. As with the standard Yaletrac the overload protection comes in the form of sheer pins which are easily replaced with the spare pins which are stored on board if required. The load does not need to be removed to replace sheered pins. 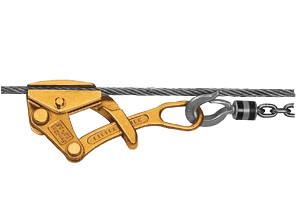 A clamp disengagement lever allows the wire rope to be fitted easily, and pulled through to the desired length required for the task. The larger openings facilitate easy cleaning and lubricating to further extend the life of the wire rope cable puller. 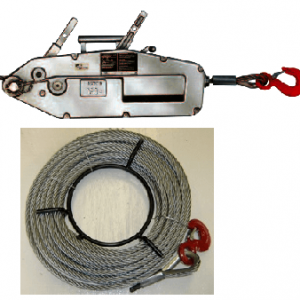 The 6 stranded wire rope has a steel core and offers the strength and flexibility these cable pullers need, tapered for easy placement at one end and with a safety latched hook at the other. 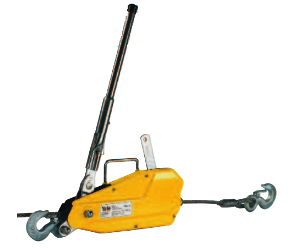 Lifting Hoists Direct can supply the Yaletrac ST rope puller in a choice of 3 capacities; 1000kg, 1600kg and 3200kg. 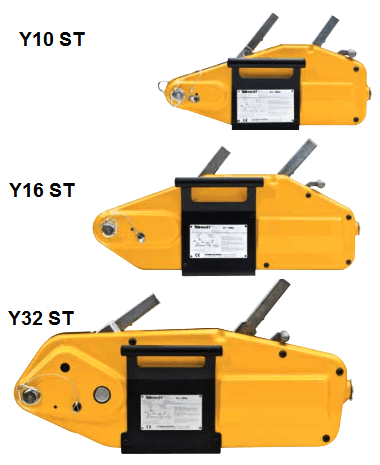 Storage boxes, extra long wire rope and drum reeler's are available on request for the ST.
All Yale cable pullers are not intended for personnel elevations.